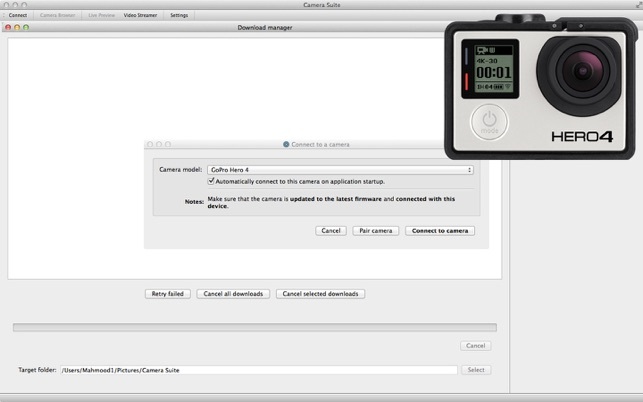 Camera Suite allows you to control GoPro Hero 2, 3, 3+, 4, 5, 6, 7 cameras over Wifi on a Mac. 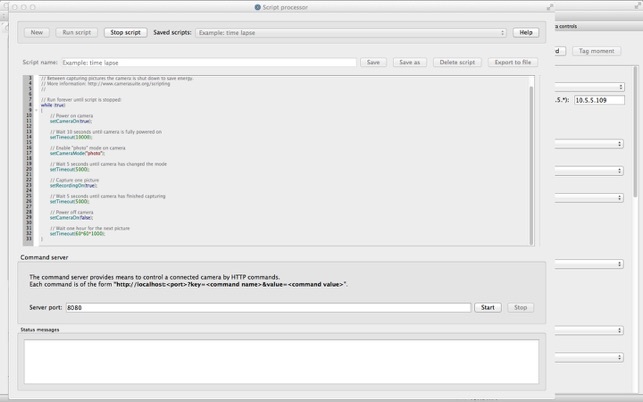 It supports audio and video live streaming, media browsing, and a powerful scripting language to control the camera. - Connect GoPro Hero 2 (with Wifi bacpac), 3, 3+, 4 (including Hero 4 Session), Hero 5, Hero 6, HERO 2018, Hero 7 cameras over Wifi with your Mac. - Support for GoPro Hero 4/5/6/7 pairing. - Control all important camera settings (including resolution, frame rate, camera mode, Protune, ...). - Live audio and video UDP streaming server (for instance for streaming to VLC, ffmpeg, or other media players). 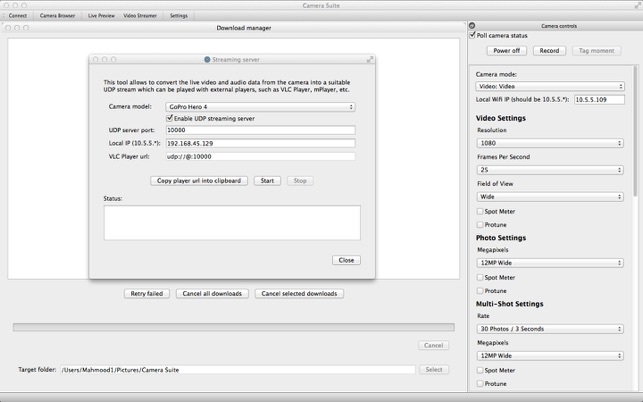 - View, stream, download, and delete media files directly over Wifi. - HTTP Command server to remotely control the camera via HTTP using a simple REST API. If you cannot see the live preview then make sure that the macOS firewall does not block the UDP port 8554 (details: https://support.apple.com/en-us/HT201642). - Added support for GoPro Hero 7 cameras. I purchased this solely to be able to download files instead of the hassle of finding all the micro card stuff. 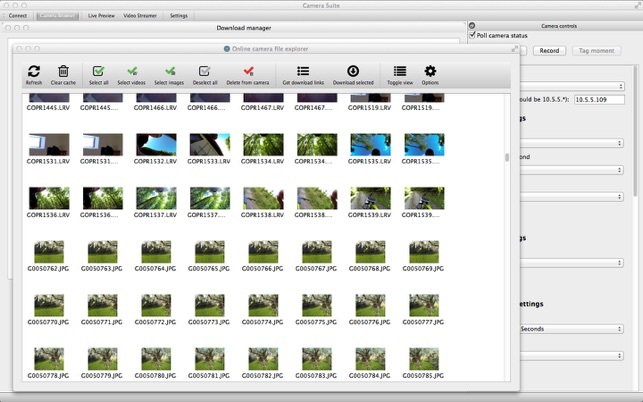 The camera info correctly shows the number of files on the unit but the sofware shows nothing to select from in the browser window. This software does not allow therefor ANY files to be either viewed or downloaded from my Hero 3 but it will control the camera. Since the only reason I purchased the software was for file downloading via wifi and since this function does not work at all on my Hero 3 I rate it poorly. Great app, works as intended. Gave me the option to use my Mac instead of my iPhone. Controls are the same as GoPro’s iPhone app. I like the way it give you links to download the GoPro files directly with using your browser. if you’re using a mac, this program is not needed. Simply plug in the SD chip into a SD/MMC/USB holder and insert into a USB port. Quicktime will download the files onto your mac,and you can make most minor adjustments such as horizontal or vertical flips.